Take a long, relaxing soak with the calming ambience of the Tisserand Aromatherapy Lavender & Chamomile Bath Oil that will leave your skin feeling deeply nourished. Fragrant lavender essential oil de-stresses your mind while nourishing and hydrating coconut and sweet almond oils will leave your skin wonderfully smooth and will replenish the moisture levels, creating an all-round blissful bathing experience. Lavender & Chamomile Bath Oil is so calming and caring, it can even be used by those who suffer from very sensitive or reactive skin and thanks to the calming aroma it is perfect for those suffering from anxiety or stress. Is there anything better than a leisurely soak in the bath and your favourite book? Well, when you combine these things with the Tisserand Lavender & Chamomile Bath Oil, then yes, there is! In this day and age, we are also so busy and everyday stresses can really get on top of us, so it’s important to take a little time out for yourself. We think this indulgent bath oil is the perfect way to achieve total relaxation. Add 1 or 2 capfuls to your running bath and swirl to disperse to infuse the water with the beautiful aroma of lavender and chamomile. 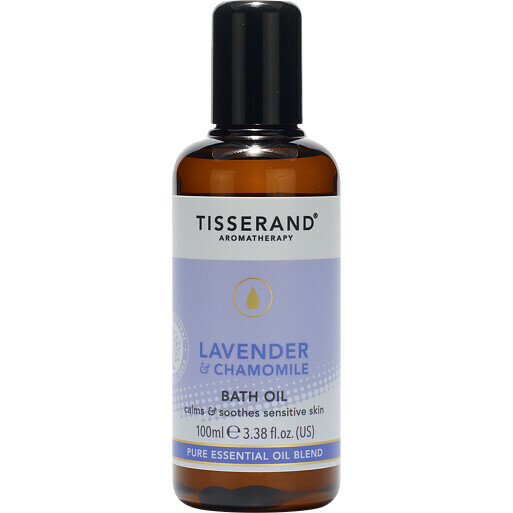 Combine with other products from the Tisserand Aromatherapy Lavender & Chamomile collection, a naturally kind and nourishing range of products that are suitable for all skin types including sensitive and reactive skin. Contains 100% natural, pure essential oils.